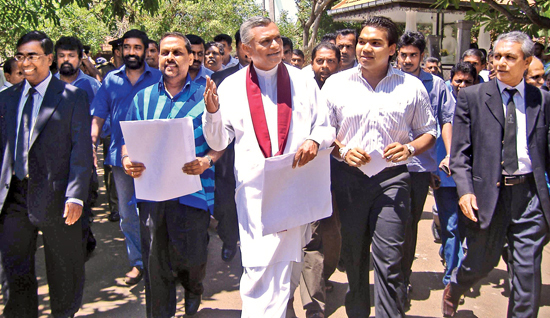 The UPFA list of candidates contesting the forthcoming parliamentary election for Gampaha District was handed over by UPFA district leader Senior Presidential Advisor Basil Rajapaksa at the Gampaha Kachcheri yesterday. 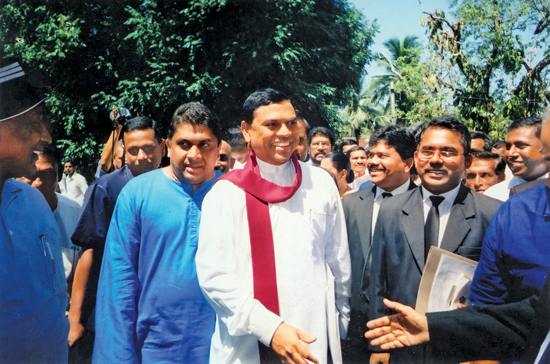 Here the UPFA candidates welcome Basil Rajapaksa after he handed over the nomination papers. Picture by Nimal Jayasinghe, Gampaha Roving Corr. Central Provincial Council UNP Member S. Rajaratnam has warned that he might have to take alternative steps if the leadership fields Mano Ganeshan in the Kandy District. He said that there is an opportunity to elect a Tamil representative from the Kandy District. Therefore, the UNP should not take any decision to destroy this opportunity. He added that he had informed the UNP leadership about it.